The 11 Best Spots for Noodles in New Mexico! If you’ve got a craving for lo mein, ramen, or Pad Thai, the mouthwatering noodle places of New Mexico have you covered. Noodle dishes come in the form of appetizers, in soups, and as the main course in a great stir fry. Whatever you’re craving, you’ll find it at the 10 best noodle places in New Mexico. There’s nothing better on a cold day…or any day for that matter…than a hot, steaming bowl of noodle soup served here. Fresh and cooked-to-order noodle and rice dishes, is a varied selection of traditional pan-Asian favorites, fusion choices and vegetarian options. Favorites include Pad Thai, Vietnamese pho, and teriyaki udon. Authentic Southern Chinese food at this small hole-in-the-wall restaurant tucked away in the Santa Fe Plaza is a discovery worth searching for. The cuisine at this family-owned spot is homemade with only organic and natural, many locally-sourced, ingredients in the mix. A commitment to healthy foods keeps the menu fresh and exciting. Spicy pork noodle soup is a standout. Vegetarian options, too. Looking for the unexpected in New Mexican cuisine? Here’s the spot. A step into the culture and food of Thailand where you’ll find authentic, flavorful fare. A fan favorite is the drunken noodles, a blend of vegetables, herbs and green curry paste. But don’t miss the beef noodle soup or the Lad Na, big fat noodles, with vegetables, topped with an egg, smothered in gravy. You can heat things up just by asking for extra spiciness. This food spot is all about outdoor dining. That’s because it’s a food cart. You don’t step inside, you just walk up and place your order at Marshall, the owner’s, dining al fresco eatery. It’s eclectic, multi-cultural, affordable and the food is made with fresh, local ingredients. The menu isn’t large, but it’s good Asian inspired made-to-order food. The bison sukiyaki shoyu ramen is a must, as are the red curry coconut rice noodles. Take the family to a family-style dinner complete with 10 different meal choices. It’s the best way for everyone to get a little taste of everything. If, however, that’s more than you want to eat, there are plenty of noodle options like the national dish of Thailand, Pad Thai or sukiyaki, and on the spicy side, yen-ta-fo. Noodle soups, plus Chinese specialties like lo mein are great comfort foods. Noodles play an essential role in Chinese cooking, so much so that there is a wide variety of shapes, widths, and ingredients. You’ll find wide wonton-type noodles in the chicken noodle soup, a little thicker variety in the stir-fry dish lo mein and, of course, thin Hong Kong-style pan-fried noodles in the chow mein. All make for a hearty, filling meal. Very generous portions served here. Growing up in a family of chefs, coupled with a stint in culinary school learning traditional Chinese cooking honed owner Chef Chu’s commitment to preparing exceptional food. Dishes are made with fresh ingredients and the authentic flavors of Northern China. No MSG, no artificial flavor, no canned food and no preservatives are used. Try the house special lo mein, chockfull of tender noodles. Order sparingly, portions are large. You’ll find an appealing blend of Chinese and Korean dishes at this restaurant anchoring one end of a small mall. You can special order off the menu and the chef will make an authentic Chinese dish. Chow mein, with fried crispy noodles, and lo mein, with a softer boiled noodle are on the menu with a variety of ingredient choices. The seafood noodle soup is great for lunch or dinner. Eat in or take home. A popular dish here, Singapore noodles, is served with crispy rice noodles. It’s been a house favorite for the more than 20 years this restaurant has been serving the local community. Other favorites include rice noodles with tofu and Kung Pao shrimp and authentic chicken, beef, pork and vegetable lo mein. Gluten free and non-MSG dishes available upon request. 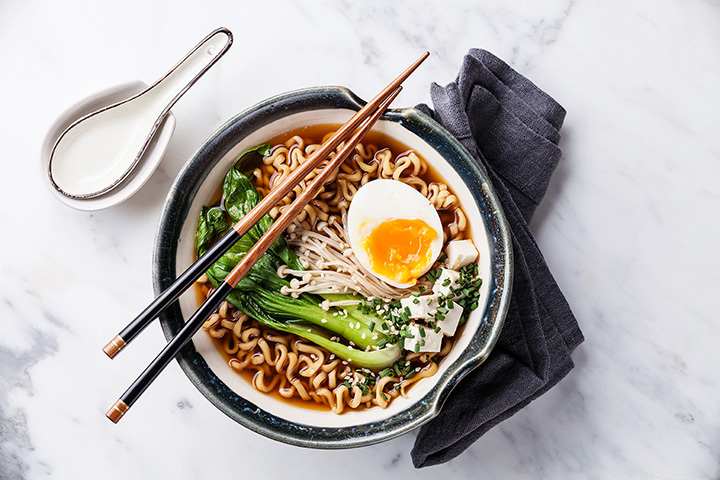 If you’ve got a hankering for ramen, those scrumptious wheat noodles in broth topped with meats and veggies of your choice, then look no further than here. Choose either a beef, fish, chicken or vegetable broth depending on your tastes or special food needs. All dishes are made from scratch. Each comes garnished with bamboo shoots, mushrooms, pickled red ginger, scallions, and marinated egg. Gluten free choice comes with rice noodles. Want it spicy? Ask for #5 heat…extra spicy! Enjoy authentic Thai cuisine in the heart of downtown in a spot that embodies the colors, aromas and culture of Thailand. If you’re looking for a noodle fix, start with the noodle rolls, a fresh rice noodle wrap filled with shrimp and vegetables, move right on to house noodle soup and finish with any one of the traditional main dishes with flat rice or egg noodles. The Pad Kee Mao is a great choice. Vegetarian and gluten free choices, too.